One of the most important components of a good cocktail is bitters. Sure everyone knows about Angostura and Peychaud’s, but at Geeks Who Eat Headquarters AZ Bitters Lab bitters rule the roost. Out of all of the bitters we have (and boy howdy do we have a lot), AZ Bitters Lab are by far our favorite, that’s why this week’s Things We Love Thursday is all about their bitters. 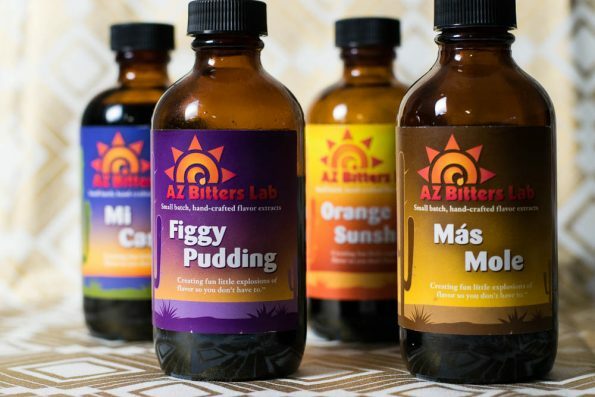 AZ Bitters Lab was founded by Arizona native Lillian and Bostonian Bill Buitenhuys. After marrying, they spent their first years together in New England. While there they enjoyed the wine and food scene of Boston, and grew to enjoy pairing obscure wines with food creations at home. After landing back in Phoenix, they found that some wonderful local bartenders were doing fun things in pairing cocktails with food. The ability to tune a cocktail to play off of food flavor profiles really resonated with them and the more they talked with bartenders, the more they learned of the arrays of house-made tinctures, infusions, and bitters that were hiding behind these bars. Intrigued, they started experimenting in little Mason jars with various herbs, zests, spices, and spirits. The little Mason jars soon became larger Mason jars. They started sharing samples with family, friends, and the bartenders who had inspired them. With so much positive feedback, they would add more of this, change out this ingredient to that, and kept on experimenting until they felt they nailed a few recipes. With a focus to build that little explosion of flavor-forward taste, they moved from Mason jars to a much larger scale. Their ingredients are carefully sourced from local vendors; everything is hand chopped, zested, and blended. They do all the mixing, tasting, bottling, and labeling by hand in an FDA-approved kitchen. It has honestly been so long since we discovered AZ Bitters Lab, that it is hard to remember where we first heard of them. If memory serves, it was likely Twitter. After that, we saw them in our local Whole Foods and decided to grab a bottle of Más Mole Bitters as its flavor profile appealed to us the most. After playing around with Más Mole, we knew that the other flavors needed to come live with us and soon we owned all of the flavors. AZ Bitters Lab bitters were one of the catalysts in drawing us into the craft cocktail world. Sure, we’d had a good Old Fashioned or any other classic cocktail, but trying these same drinks with the addition of any of their bitters opened our eyes to a new world of flavor. Since then, we try to purchase any new and unusual bitters we find (our bitters basket is now a bitters counter). Here is a little confession: we still get excited when we see AZ Bitters Lab on a cocktail menu (it definitely makes us more likely to order that drink). 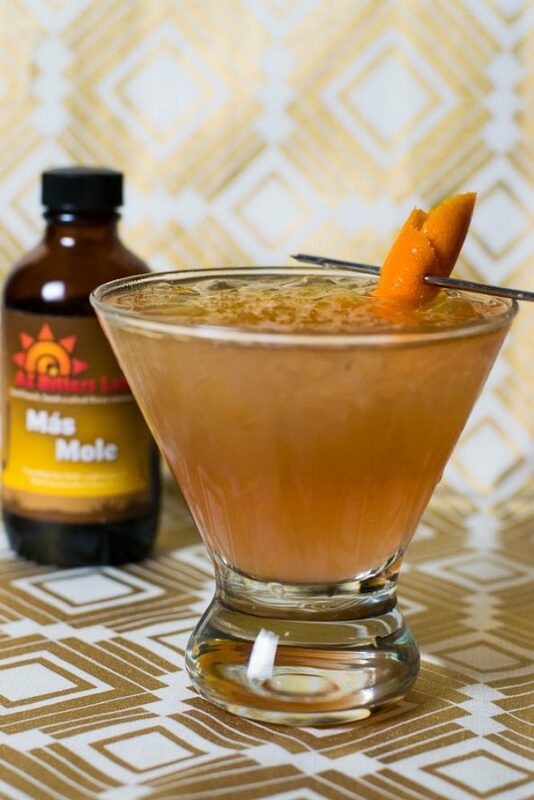 Besides making delicious new cocktails (see the recipe below), we love using AZ Bitters Lab Bitters in a number of ways. We add it to classic cocktails like our margaritas, as well as use it in coffee (Figgy Bitters in Iced Coffee is like Christmas all year). Bill and Lillian have even suggested adding it to ice cream (we have yet to try this, but soon!). The AZ Bitters Lab website has some great suggestions for uses of their bitters, as well as some dynamite recipes! Since starting in 2011, AZ Bitters Lab has grown from a home project to a small business with four released flavors (Mi Casa, Orange Sunshine, Figgy Bitters, and Más Mole) that are used in bars and restaurants throughout the country and sold via retail shops in metro Phoenix, Tucson, Prescott, Boston metro, San Diego, St. Louis, and Napa Valley, as well as through their website and other online retailers in the US and in Australia/New Zealand (a full list of where you can purchase AZ Bitters Lab Bitters can be found here). Fill tumbler with crushed ice. Pour all ingredients over ice, stir. Next → Next post: Celebrate Derby Day in the Valley with a Mint Julep!